As part of their Earth Stewardship mission, Church of the Brethren in Modesto, CA has worked on energy issues over the last several years, moving to compact fluorescent lighting in the sanctuary and putting timers on heating and cooling units. The church also has a vibrant community garden. Wishing to do more, and after several months of study and consideration, they decided to install a 57 kW ground mounted solar system to provide a complete offset of the church’s electric usage. Over the next 25 years, the solar system will prevent 3.4 million pounds of CO2 from being released. 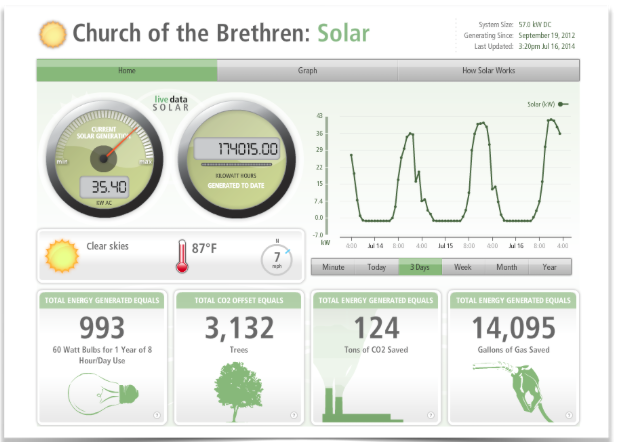 The system now covers 100% of the church’s electricity consumption and the church has received positive media attention. They also attracted the attention of Assemblywoman Kristen Olsen, who came to see what people of faith are doing to fight climate change. By broadcasting their story and sharing their experiences, Church of the Brethren is having an impact far beyond its church walls.